It might not feel like it, but fall backpacking season is almost upon us again. Come the end of August, as the air gradually starts to cool off and the leaves slowly begin to change their colors, outdoor enthusiasts across the Southeast will rejoice and start to wonder where they might wander to find that perfect backcountry camping trip this autumn. Home to high grassy balds with wild ponies, 400-year-old dense hardwood forests, rhododendron-lined streams, some of the richest biodiversity in the world, and so much more, the Southeast has no shortage of incredible places to go backpacking. These four trip ideas are all entry level treks perfect for the fall season. If you’re feeling especially ambitious, you could even string these trips together on a mini Southeastern road tour that winds through the hills and might leave you wishing fall lasted a bit longer. While most people show up here in the summer and spring to roam the hills around Wilburn Ridge, the fall welcomes fewer crowds, with many staying in the lower elevations. 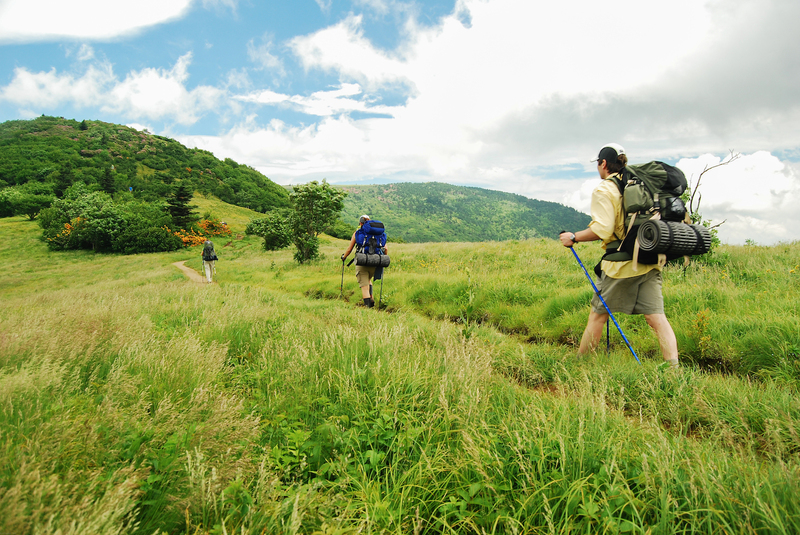 Hiking the classic 7-mile leg of the Appalachian Trail between Massie Gap and Elk Garden is sure to be a relaxing walk with few challenges and many tent sites. Virginia’s highest point, Mount Rogers, sits at 5,729-feet and is located off a spur trail from the AT around the middle of a two night trip. In the fall, the view from this peak stretches as far as the eye can see with a Fruity Pebbles-like smattering and splotching of fall color. If morning finds you here rested and cozy in your bag, the sun illuminating the valleys and ridgelines to the south can provide a great perspective on the change of season. The Roan Highlands easily offer up one of the most spectacular natural settings in the state of Tennessee, if not the entire Southeast. Reminiscent of the type of sweeping Scottish landscape you’d see in Braveheart, Roan Mountain and its high grassy balds are crown jewels of Southern Appalachia. Located in eastern Tennessee on the edge of western North Carolina, this place gets all the attention in late spring when the flowers pop, but the fall is an equally appealing time to visit, as you’ll likely experience an ethereal foggy mist lazily rising and hanging over the wooded valleys below. A 5-mile leg of the AT from Carver’s Gap parking lot on the state line to the Overmountain Barn Shelter can offer a fall backpacking trip that would probably make even the biggest anti-hiker fall in love with the outdoors. Be sure to take the spur trail up Grassy Ridge Bald for a big view from a rock outcropping. If sleeping in the barn shelter with room for up to 20 people sounds more like unrest, there are about 6 flat sites by the barn that offer a great view for that early morning step out of the tent. Whether you camp out on the balds if the weather allows, set up a tent in the treeline, get a free permit to stay in an AT shelter, or simply go for the day, the Roans are sure to please. Again, bring layers, as you’ll be walking along at an average of 5000’ elevation. Be ready for possible snow after October. Loaded with creekside campsites, this 5-mile stretch of trail runs alongside Dodd Creek in the vast Cohutta Wilderness of northern Georgia. While it may be a little more busy in the fall than the above options, it will be a bit warmer, as it sits around 2500’ elevation. The color peaks here about mid-October. If you chose this area for a shorter hike, start collecting firewood a little earlier than usual, as a lot of the dead wood gets scavenged around the tent sites with the amount of traffic the area receives. From the parking lot, the trail winds through a jungle of hardwood and rhododendron forests with about 400’ of elevation gain to end at Raven Cliff Falls. Moss and ferns hold out a little longer in this canyon, as tree canopy covers most of the trail. The most impressive thing here is probably the water features and the easily-accessible campsites. After only 2.5 miles, Raven Cliff Falls seems to split the cliffline before it plunges and carves its way towards the trailhead. The sound of the water pairs quite well with a late-afternoon shower of golden leaves as you sit against a mossy stump or walk along the easy, yet rocky, trail. Whether you prefer to stay at a nearby campground and day-hike, or if you’re getting out a little farther in the adjacent Slickrock Wilderness, a walk under Joyce Kilmer’s canopy offers an easy 2-mile stroll through gorgeous old-growth forests. Leaves have a little farther to fall from the virgin 400 year-old hardwoods that reside here, the oldest standing over 100 feet tall in Poplar Cove on the northern end of a figure-eight loop hike. Of course there are many options in the Southeast, but these four options offer a great intro into fall backpacking in the Southeast, with easy-to-moderate difficulty and huge panoramic pay-offs. Maybe throw in a little more gear on these low-milage strolls. If you choose to go to a higher elevation for your fall galavant, consider going in late September or very early October to catch the color peak up top and watch it fade to green below. October through November provides better fall color in elevations below 5,000 feet. Ride the Divide: It’s Outrageous Fun!